In ACRN, UART virtualization is implemented as a fully-emulated device. 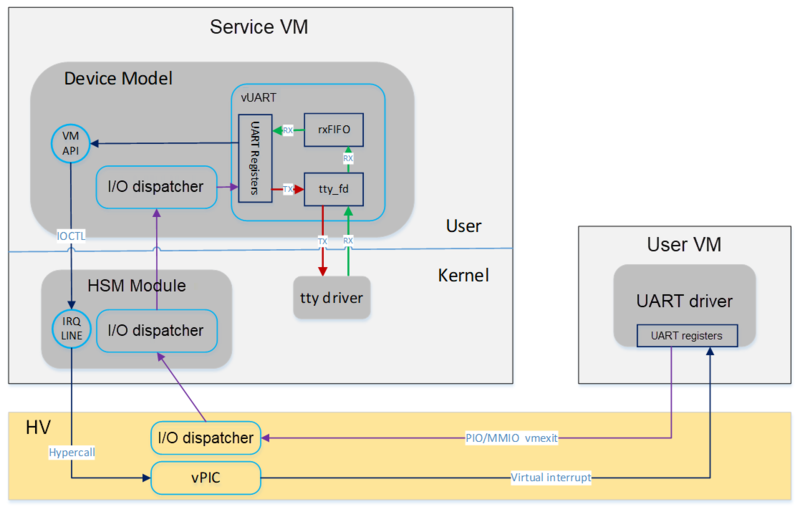 In the Service OS (SOS), UART virtualization is implemented in the hypervisor itself. In the User OS (UOS), UART virtualization is implemented in the Device Model (DM), and is the primary topic of this document. We’ll summarize differences between the hypervisor and DM implementations at the end of this document. UART emulation is a typical full-emulation implementation and is a good example to learn about I/O emulation in a virtualized environment. There is a detailed explanation about the I/O emulation flow in ACRN in ACRN I/O mediator. There are three objects used to emulate one UART device in DM: UART registers, rxFIFO, and backend tty devices. UART registers are emulated by member variables in struct uart_vdev, one variable for each register. These variables are used to track the register status programed by the frontend driver. The handler of each register depends on the register’s functionality. A FIFO is implemented to emulate RX. Normally characters are read from the backend tty device when available, then put into the rxFIFO. When the Guest application tries to read from the UART, the access to register com_data causes a vmexit. Device model catches the vmexit and emulates the UART by returning one character from rxFIFO. When com_fcr is available, the Guest application can write 0 to this register to disable rxFIFO. In this case the rxFIFO in device model degenerates to a buffer containing only one character. When the Guest application tries to send a character to the UART, it writes to the com_data register, which will cause a vmexit as well. Device model catches the vmexit and emulates the UART by redirecting the character to the backend tty device. The UART device emulated by the ACRN device model is connected to the system by the LPC bus. In the current implementation, two channel LPC UARTs are I/O mapped to the traditional COM port addresses of 0x3F8 and 0x2F8. These are defined in global variable uart_lres. The first parameter here is the name of the UART (must be “com1” or “com2”). The second parameter is species the backend tty device: stdio or a path to the dedicated tty device node, for example /dev/pts/0. When acrn-dm starts, pci_lpc_init is called as the callback of the vdev_init of the PCI device given on the acrn-dm command line. Later, lpc_init is called in pci_lpc_init. lpc_init iterates on the available UART instances defined on the command line and initializes them one by one. register_inout is called on the port region of each UART instance, enabling access to the UART ports to be routed to the registered handler. In the case of UART emulation, the registered handlers are uart_read and uart_write.